PRODUCTIVITY is a mobile personal working space that seeks to rethink and reinvent the office environment. 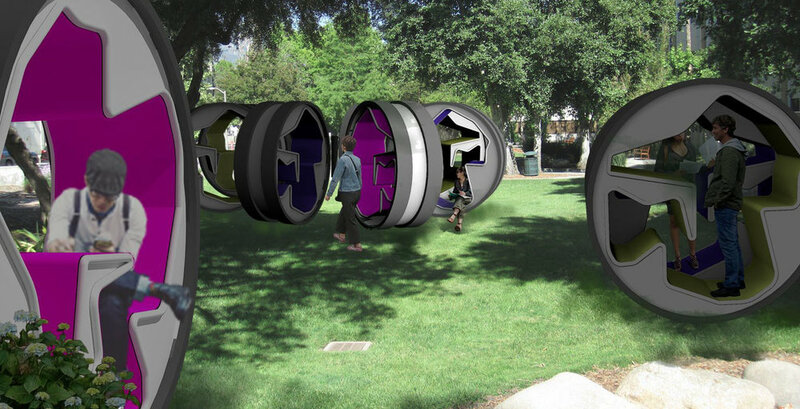 Zero Gravity Collaboration Space is an outdoor individual and collaborative workspace organized within a large wheel. This indoor scheme aims to create a versatile preprogrammed variation of office territories controlled by the user. The outdoor scheme focuses on the interchangeable fluctuating relationship between work and leisure in a day. 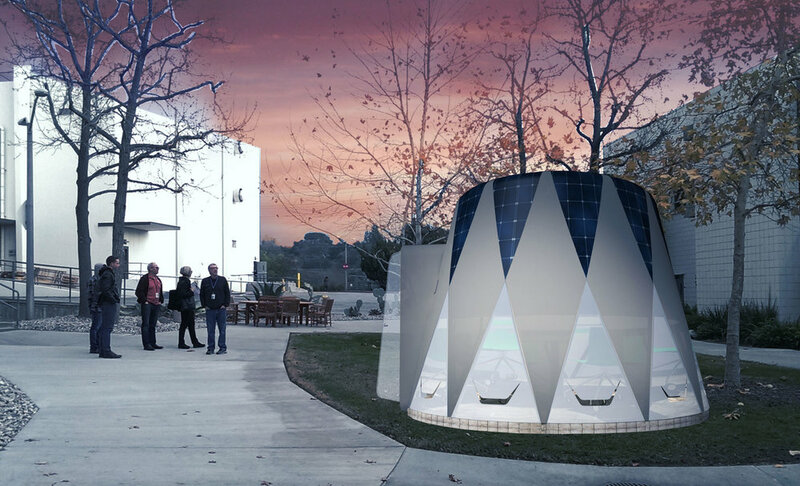 A self-contained outdoor collaborative environment, the Escape Yurt is an expeditionary, pod-like space for ad hoc meetings, deep think time, and lunch. Light Boxes provides a visually appealing and pragmatic experimental environment for understanding cubicle privacy preferences. Although the office building is hardly extinct, its architecture has been almost mind-numbing in its formulaic approach to design. cityLAB partners with various organizations to develop research on workplace patterns and relationships. That research feeds into speculative proposals that demonstrate a range of architectural alternatives to conventional office design. In cities today, people seem to work anywhere and everywhere. For knowledge workers untethered from a factory and even from their desks, a chair and Wi-Fi are the only necessities. A park bench, cafe, or bus will suffice. Where does this leave architecture, if the office building and the office itself are in decline? In downtown Los Angeles in 2015, for example, the office vacancy rate was over 18%, a couple of points above the national average. Until the arrival of the immense, mixed-use Wilshire Grand Center in 2016, no office tower had been built in downtown for twenty years. Although the office building is hardly extinct, its architecture has been almost mind-numbing in its formulaic approach to design. Over the past five years, cityLAB has partnered with a wide range of organizations that are interested in new alternatives for office design. That research is documented here, along with new design proposals that demonstrate a range of architectural alternatives to conventional office design. These are not meant as definitive or singular solutions, but as conceptual strategies that offer new directions based on enhancing technologies that are either currently available or in early development. In particular, the demand for "Deep Think" space among a sea of conventional offices spaces, was voiced by one of cityLAB research partners, Jet Propulsion Laboratory (JPL) in Pasadena, California. As its workforce continues to grow, management has been forced to consider ways to strike a balance between increasing productivity and collaboration while reducing the office footprint. Six proposals were put together by design partners in collaboration with cityLAB from around the city--including AN.ONYMOUS (Marta Nowak), REMAP (Jeff Burke and Randy Illum), and Guvenc Özel-- respond to JPL's need for "Deep Think" space.